The colored Infra-red image shows TC Evan's eye just north of the Vanua Levu coast when it was close to it's peak intensity. Highest winds 10-minute sustained:185 km/h (115 mph), 1-minute sustained:230 km/h (145 mph). Lowest pressure 943 mbar (hPa); 27.85 inH. Fiji has many micro-climates that are indicative of the effect of the local environment and the varying tropical seasons. The spectrum of island sizes coupled with the terrain and location within the archipelago have a major influence on the weather conditions that exist at a specific location. 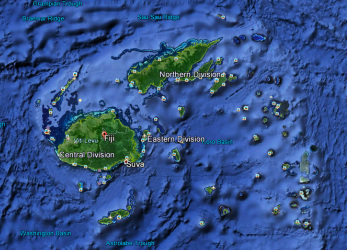 A number of studies have documented some of these variances and the author of this site is currently consolidating this research with the goal of accurately defining the micro-climates of Fiji.